Ever since I started blogging, I have been experimenting a lot of baking at home. 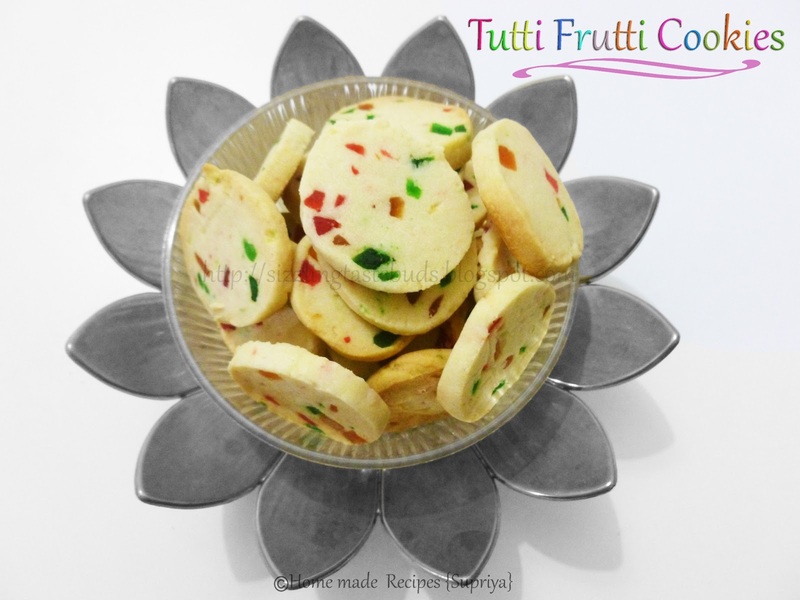 My recent try was this Tutti Frutti Christmas Special Cookies. Yes! 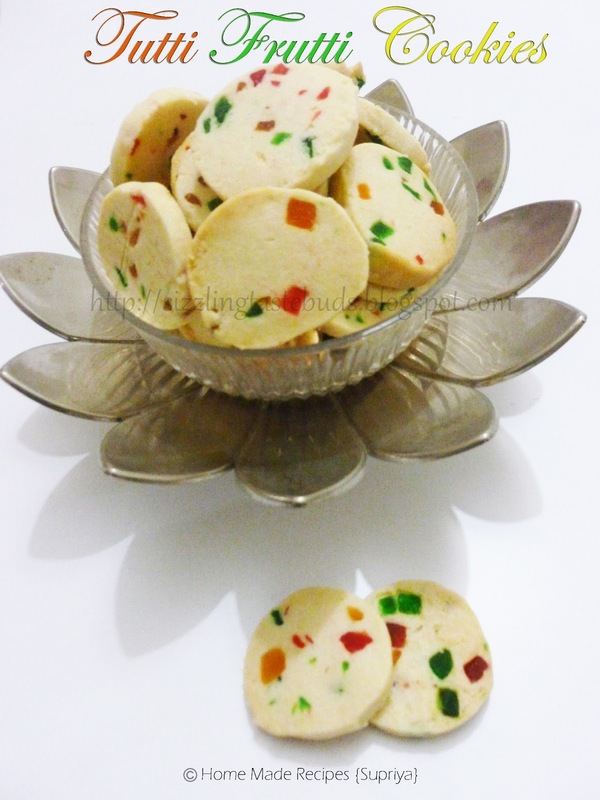 This is specially baked during Christmas time in Goa and I have tasted it in Goa during the festive mood and that was before my marriage. Since I love to cook and bake yummy delicious cookies for my DH and my little boy, I tried it last month and it came out super good , crisp and melts in mouth. 1. Powder the sugar and bring the butter to room temperature. 2. In a mixing bowl, add powdered sugar and butter. Cream this to light and fluffy. 3. 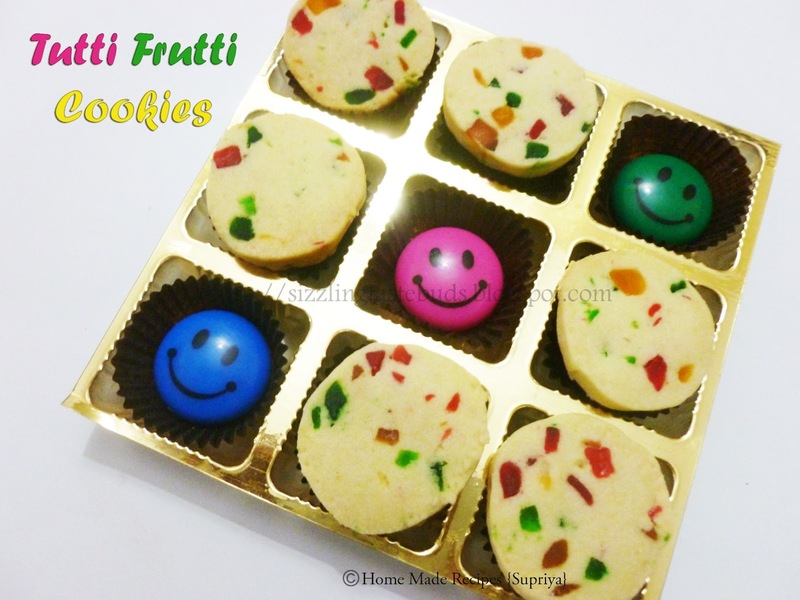 Add maida, tutti frutti and mix well. 4. Add milk to form a soft sticky dough. Lay a butter paper and roll the dough and form a log. Dust some flour if needed. 5. Wrap it with a butter paper and freeze it in a freezer for 40 mins. 6. Meanwhile, preheat the oven at 180C for 10 mins. 7. Remove the dough logs from the freezer and slice them into thick slices appx 1/2 an inch. 8. Line the baking tray or a cake mold with butter paper and place these cookies carefully on a baking tray leaving some space in between each cookie. The cookies doesn't spread, still its better to follow this step. Don't use a knife with wavy impressions. Always use a smooth finish knife or a plain sharp knife with no impressions to cut the cookie dough log. This results in getting a smooth layer on a cookie. The cookies turn out crisp when its cooled completely.